A government report shows that the economy added 304,000 jobs in January, well above economists' average projection of 165,000. Despite speculation that the economy is slowing, jobs growth is thriving under President Donald Trump, a Labor Department report shows. The U.S. economy created nearly double the expected number of jobs in January, extending a robust pace set last year after President Donald Trump's $1.5 trillion of tax cuts stimulated growth. Nonfarm payrolls climbed by about 304,000 in January, the Department of Labor's Bureau of Labor Statistics said in a report on Friday, Feb. 1. That level was well above economists' average estimate of 165,000 new jobs in a survey by the data provider FactSet. 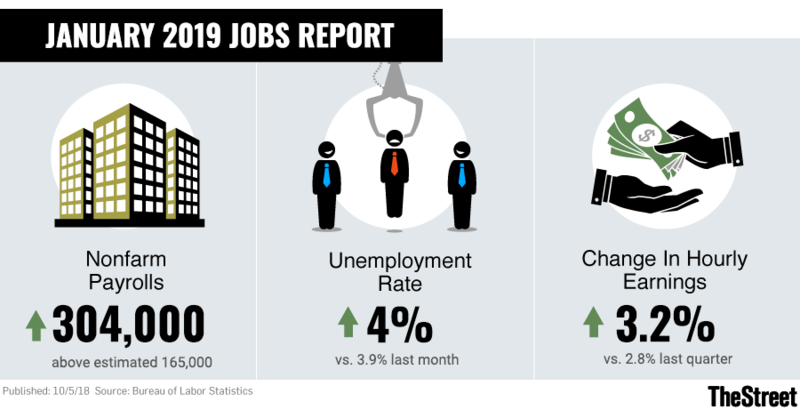 The report, however, provided a big downward revision of the previous month's jobs report, which was unusually strong. The economy added 222,000 jobs in December, instead of the 312,000 reported a month ago. The latest data lend support to the assertions by Trump administration officials as well as Federal Reserve Chairman Jerome Powell that economic growth is proceeding apace despite investor fears of a slowdown or even a recession. The pessimism helped send the S&P 500 plunging in late December, leaving the gauge down about 6% for all of 2018. Despite the robust jobs growth during the month, the unemployment rate edged up to 4% from 3.9%. Last year, the rate had dipped as low as 3.7%, the lowest in a half-century, though some forecasters believe the economy is running so hot that it's luring back some aspiring workers who previously were so discouraged that they had stopped looking for jobs. "It was a blowout number, no doubt about it," said Scott Anderson, chief economist at Bank of the West, a unit of the French bank BNP Paribas SA. "We're bringing people back into the labor force." Average hourly earnings rose by 3 cents to $27.56, leaving them up 3.2% over the past 12 months. That's a slowdown from the prior month's 3.3% wage growth, in a signal that inflationary pressures remain muted even with the unusually strong labor market. The Federal Reserve recently shifted its stance on U.S. interest rates, pausing a three-year campaign to raise the benchmark borrowing costs because of the apparent lack of inflation. Stocks have rallied on that news, since lower interest rates typically lead to faster earnings growth for companies. Trump had criticized Powell for raising rates too quickly, unnecessarily jeopardizing the current economic expansion. Consumer prices are rising at a roughly 2% annual pace, right around the Fed's target for inflation. "There's really no inflationary pressures to speak of," Anderson said.